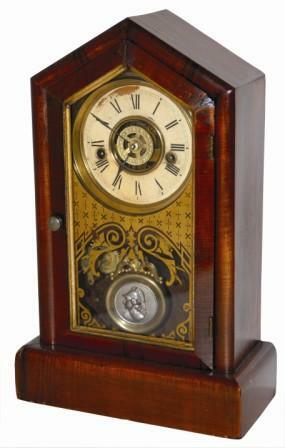 Waterbury Clock Company wood cased mantle clock, "Beacon No. 2", ca 1883. Rosewood veneered case is 15" tall, has 4-5 small corner chips, but is polished and clean. Gold trim around the door glass, and a wonderful glass that is identical to that pictured in the books. The pendulum, dial, hands, and dial rings are also identical. The dial is signed, has some paint loss at the top, and a big alarm set ring in the center. The alarm movement and brass bell are in the bottom, and the one day running movement is above. It is running and striking, and a winding key is inside. No label, but a paper on the backboard. Ly-Waterbury No. 1518.